Although a distance of more than a quarter-century separates us from that fateful day in December 1991 when the Union of Soviet Socialist Republics (USSR) ceased to exist, understanding of the Soviet collapse remains unsatisfactory and incomplete. The global working class is still reeling from the blows of that two-year period from 1989 to 1991 – when socialism was dismantled from Berlin to Khabarovsk. Yet, we still haven’t fully understood the nature of those blows. Such a situation must be remedied. Existing socialist states face many of the same external pressures that the Soviet Union faced; future socialist states will too. In addition to interference from the imperialist world, the socialist experiments thus far have faced a number of internal problems: how to maintain economic growth in the face of constantly changing needs and expectations; how to maintain revolutionary momentum through the second, third and fourth generations of the revolution; how to balance a revolutionary internationalist foreign policy with the need to maintain peaceful coexistence with the capitalist world; how to avoid economic and diplomatic isolation and to take advantage of the latest global developments in science and technology. These problems are faced by the remaining socialist countries, just as they were faced by the USSR. experience, the better prepared we will be to prevent historic reverses and defeats in future, and the better equipped we will be to develop a compelling, convincing vision of socialism that is relevant in the here and now. Needless to say, this book doesn’t seek to present definitive answers. The disappearance of the USSR is a vastly complex subject, incorporating history, politics, economics, sociology, philosophy, military science, social psychology and more. Others know more and have done more thorough research than I have. The idea here is simply to present a historical outline, raise some questions, put forward some hypotheses, and contribute to the ongoing debate. I make no apologies for taking a partisan perspective; of defending the achievements of the Soviet Union; of standing on the workers’ side of the barricades in the global class war. If the reader is looking for a triumphalist, anti-communist account of the Soviet demise, such a thing can easily be found, but not here. The starting point of this book is that the immense problems faced by humanity cannot be solved within a political-economic framework of capitalism; that the transition towards socialism and communism is both desirable and necessary. It is difficult to divide such a complex subject into neat segments, and the chapter headings I’ve ended up with are an unusual hybrid of chronological and thematic. Chapter 1 highlights the positive aspects of the Soviet experience and seeks to break through the wall of McCarthyite propaganda that produces a popular imagining of the USSR as totalitarian, unjust and miserable. Chapter 2 discusses the multitude of economic difficulties faced by the USSR in its last decades, and the various measures that were taken to address them. Chapter 3 paints a picture of slow but steady ideological deterioration and decaying popular confidence from the 1950s onwards; a trickle that, by the late 1980s, had developed into an irreversible torrent of anti-communism and generalized dissatisfaction. in Afghanistan. Chapter 5 deals with the period from 1985 (when Mikhail Gorbachev became General Secretary of the Communist Party of the Soviet Union) to 1989, discussing the ideas of perestroika and glasnost, concepts that came to define the period of the collapse. Chapter 6 moves on to the confusing and chaotic period of 1989–91, covering the rise of Yeltsin, the steady dismantling of Soviet power, the fall of socialist Europe, the attempts in August 1991 to save the USSR, and the details of how the world’s first socialist state was torn apart. Chapter 7 provides a brief overview of the effects of capitalist restoration on ordinary people in the former Soviet Union, as well as on the global working class. 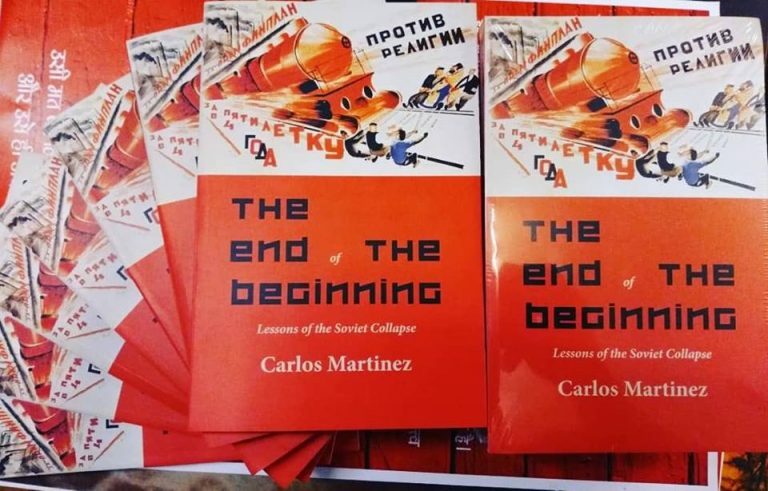 The final chapter sums up the earlier material and offers some thoughts about the relevance of the Soviet experience to the remaining socialist countries. Carlos Martinez is an activist, writer and musician based in London. He runs the political history blog Invent the Future. His major interests are the history of 'actually existing socialism' and strategies for challenging imperialism and building socialism in the 21st century. The book is available here.